the 10th largest wine producer in the world, Changyu, will open a wine city in 2016!! Wow, it's like they're building it just for me. 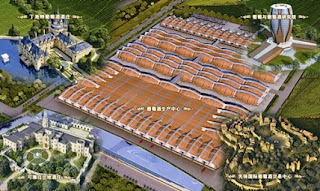 In this city will be a research institute, wine production centre, European village, vineyards, trading centres, and high end wine and brandy chateaux. Sounds to me like Disney for grown ups, and that's just fine by me! !